He's just a normal everyday kid…from another planet! It’s the end of your week. Perhaps it’s time for a snack or a meal. 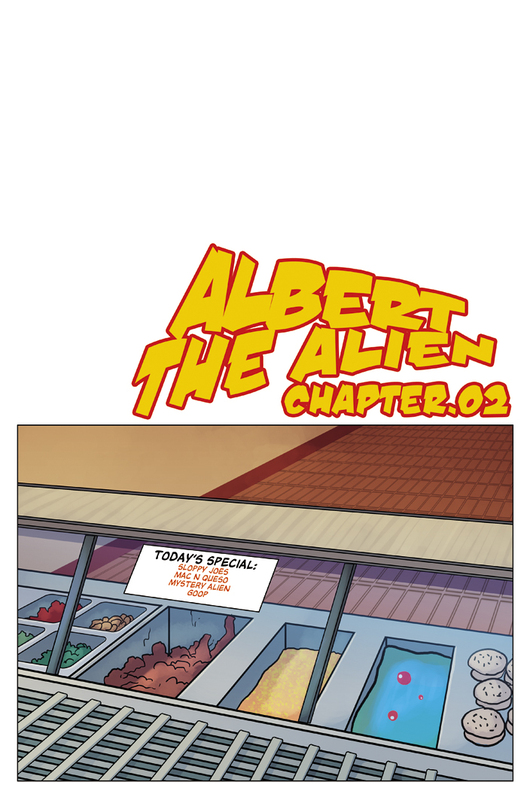 Well, have we got a treat for you: a brand new Albert the Alien! Here is our chapter cover for this new adventure. If you haven’t caught on yet, these typically tease the theme of the next chapter’s story. In this case – a food or lunch story. I remember from my days in school the cafeteria being a refuge and a chance to unwind after half a day of classes and learning. It was a chance to catch up with friends, have fun discussions, and talk about the events of the day. It was also time to find out if you fell into a category: brown baggers, or buyers. Did you bring you lunch from home, or did you buy it in the lunch line. Personally I was a brown bagger, bringing my lunch from home and occasionally buying a drink or something (although, the line to buy was always hilariously long). Usually I just brought a drink from home, and friends would get stuff for me or share, if I really wanted something. Which was rare. But I digress…. I hope you enjoyed Albert’s first adventure, and are looking forward to his next installment! And to any new readers we have picked up since the first adventure – welcome. You are among friends here. July 26-28 I’ll be a guest of honor at Anime Iowa! It’s my first time attending this show, but it sounds like a lot of fun and I’m really looking forward to it. Like all other appearances, I’ll be working the artist alley table during the day, and working panels at night. My panel schedule should be made available soon, and once it is I’ll be sure to share it out. There are currently no widgets assigned to the right-sidebar, place some! Once you add widgets to this sidebar, this default information will go away. Widgets can be added by going to your dashboard (wp-admin) ➔ Appearance ➔ Widgets, drag a widget you want to see into one of the appropriate sidebars.